Who Will Buy America’s First Eight Passenger Chairlift? Eight new eight-passenger chairlifts debuted this ski season, the highest number in history. 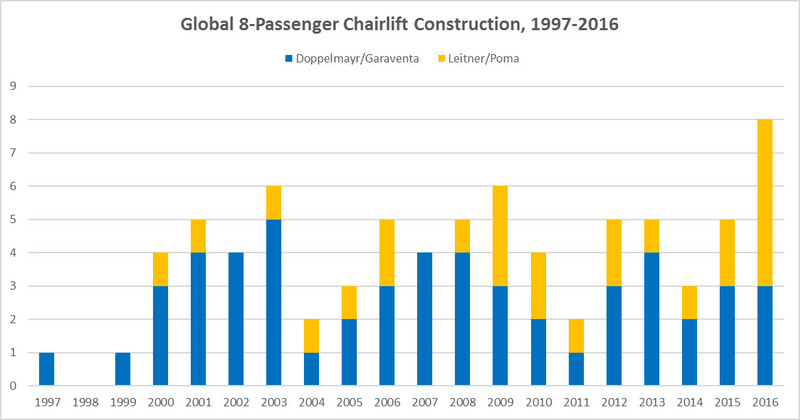 Twenty years since the technology debuted, Doppelmayr, Garaventa, Leitner and Poma have now built a combined 78 of these mega chairlifts on three continents and in eleven countries. With 2016 seeing the greatest number of eight-passenger chairlifts constructed, a question on everybody’s mind should be: when will the world’s second largest ski market finally build one? Doppelmayr debuted eight-passenger chair technology in 1997 (in Norway of all places) and continues to be the market leader, having built two-thirds of those operating today. But for the first time ever the Leitner-Poma Group installed more than Doppelmayr and Garaventa combined last year. 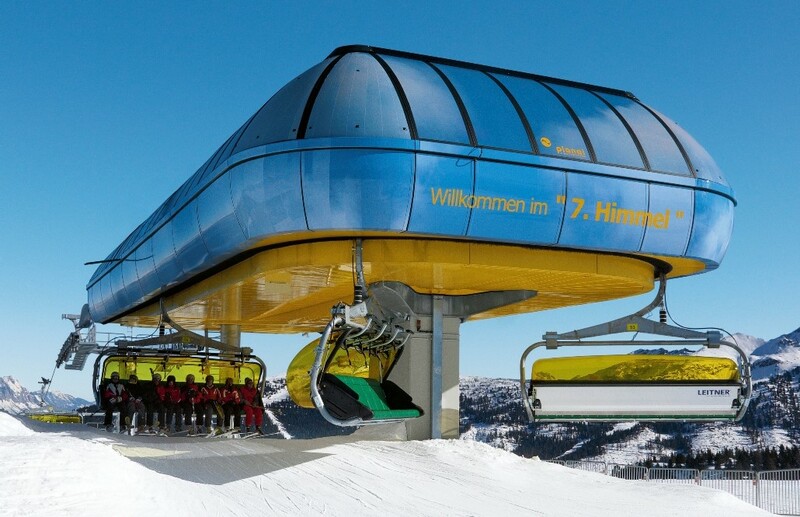 In 2006, Leitner built the first combined installation with eight-passenger chairs and 10-passenger gondola cabins and there are now seven of these across Europe. Bubble chairs and seat heating came along in 2000 and nearly every new eight-passenger lift features both these days. In total, 60 percent of eight seaters globally have bubbles and half sport heated seats. Austria is home to over 60 percent of the world’s eight-passenger chairlifts and exactly five have ever made it out of Europe. Australia and Asia each got their first in 2003 but several leading ski markets have never gone there – among them Japan, Canada, China and the United States. Before we look at who in North America could buy one of these behemoths, understand that two-thirds of those already built have a capacity at or below the maximum throughput of a six-pack. Some eight-seaters out there move fewer people than a high-speed quad and one even below the standard for a triple chair. In other words, most global operators buy these lifts not purely to move the most skiers but rather for a marketing advantage. That brings us to North American ski resorts whose brands scream size. Killington is The Beast. Vail is Like Nothing on Earth. Whistler-Blackcomb is number one at everything and Mammoth is Mammoth. The other category is resorts with two, three, or even four lifts running parallel that could all be replaced with one signature lift. Summit West at Snoqualmie, Mary Jane at Winter Park and Snowshed at Killington (again) come to mind. Most new lift technologies debut in the Alps and cross the pond eventually in a limited way. Among those were bubbles and heated seats, double loading and a lone 3S. Twenty years in with record global construction, I’m going to go out on a limb and predict an eight-pack debuts in the U.S. or Canada by December 2018. Us lift nuts have waited long enough. I think Vail, Intrawest, Powdr, and Boyne are all reluctant to start a new arms race in 8-packs–they see what’s happened in the Alps as a cautionary tale, and they really don’t want to see their relatively recent investments in 6-packs made obsolete so quickly. I’d guess that this was one of the reasons that Vail announced all those upcoming 6-packs so early… they’re signalling to competitors that it’s safe to hold off on 8-packs for a few more years. So while everything you name makes sense and is likely to see an 8-pack within the next decade (with the possible exception of Summit West), I have a hard time seeing most of them as first movers within the next year and a half. My guess will be that Mammoth Corp. comes to an accommodation with one of the manufacturers for a great deal on 3 or more 8-seaters, maybe all in one summer and maybe staggered. And mostly for Mammoth itself, but also one 8-seater at Snow Summit in the East Mountain Express alignment, replacing both high-speed quads there now. I don’t think Snow Summit needs an 8-pack for East mountain. Maybe a 6-pack. Mammoth is probably going to build a connection to Bear Mountain first, and quite a few of their other lifts are in need of upgrades. Mammoth itself wants to upgrade 1, 2, and 16. I could see 2 becoming an eight, and 1 and 16 (and maybe 10) sixes. Also, they only buy from Doppelmayr. Great article! Interesting to find out more about eight packs, since information can be kind of scarce. I can’t imagine both a 1,500 pph eight pack and a 4,400 pph eight pack. I can see an eight pack going in at Breckenridge on Peak 7 at some point to replace Independence, it is already a six pack that runs at full speed on most weekends to get through crowds but still deals with huge lines because of the added skier traffic from Peak 6. However, I agree that America’s first eight pack will be more for marketing purposes and on a signature lift line, possible ones that come to mind for me are Zephyr at Winter Park and Flyer or Eagle Copper. I simply feel that since skiing is not a significant part of our culture, but we are confident to take on our second ski run ever (maybe first), I can foresee loading/unloading problems with a lift of this size. Maybe if one is installed at a small local hill where regulars would ride it frequently or services advanced/intermediate terrain, it may be practical. However, if you also have the only 8 pack in North America, you won’t be able to get parts as fast either as they may not be stocked by your local lift supplier. You’ve hit on perhaps the biggest issue of loading/unloading efficiency. I would be interested to hear Vail Resorts management’s thoughts after inheriting the 8-passenger beginner lift at Perisher. One thing I failed to mention is 34 of the 78 built to-date have Chairkit loading carpets. That’s a pretty high percentage. Parts availability can’t be any worse than for the hundreds of ancient/orphaned lifts around the U.S. today! True. I’m thinking of parts that are more unique, such as a restraint bar, internal compression spring and the like. Most generic parts can be picked up at your local NAPA outfit. If they don’t eventually do replacements with a gondola, Park City might be a candidate for one to help alleviate the enormous crowds at its base area. Payday would be great spot for an eight-seater. With Crescent there now, I don’t see how a new gondola fits. Crescent to be replaced with a Gondi to Summit (mid-station at current unload area). Crescent to be moved to another (yet to be determined) location. You heard it here 1st. I agree, yeah. Plus with how the trails are laid out it might not make sense. @Noworlater Send it to Dreamcatcher. If an 8-pack comes to North America, it probably will not be installed at a New England mountain. The weather in NE is the hardest to run a big lift in because it is always windy, and if it isn’t, it will be the next day. Gondolas and 6-packs have trouble running due to wind regularly, and an 8-pack with or without bubbles would not stand a chance because the wind would force it to close almost all the time. Your assertions seem intuitive, but are actually counter to the experience and practice of ski resorts worldwide. The benefits of the extra weight, particularly when loaded, significantly outweigh the greater surface area and associated wind resistance. I agree with Phillip and TJ, both Payday and Silverlode are good candidates for the 8-pack. They still back up fairly often and are crucial lifts to let skiers move around the mountain. 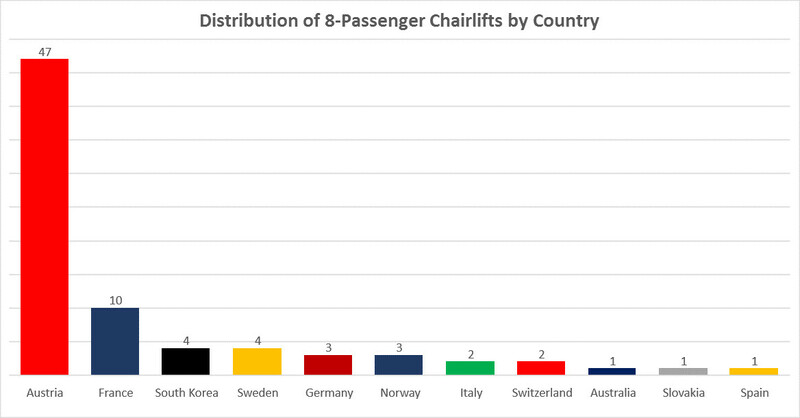 One reason why there are so many 8packs at Austria is, that the seats aren’t full. Because they haven’t a handling to full up the Chairs. The tought behind is: Better a 8pack with 6 People than a 6pack with 3 People. An other point is prestige: We got an 8Seater Chair. That with the loading unloading depend on the Space and the speed of the Chair. I know only one 8pack you can get calamitys. That the 8pack at Sölden(see picture above), the reason is, the unloding zone is imho to small. I think that Whistler got the first 8pack in North Amerika. There are 2 options. The Solar Coaster Express at Blackomb is now 30 years old. That is what the manufactures as Lifetime specify. (Doesn’t mean that you can’t run the lift longer.) This lift is always bussy. A replacement would not only transport more people. It also possible that it replace the Catskinner Chair. The other lift is the Emerald Express at Whistler Mountain. The lift is „only 20 years old“ but always bussy. The existing lift can they use as replacement of Franz’s Chair? Yes i see that befor. The Question is. Make it sense, to build a Lift so near the Emerald. Or ist better to bild a 6seater or 8seater at the place form The Emerald Lift? A 2nd option could be a lift from the Emerald base to the Yellow top. Eldora- They have Caribu & Challenge running side by side, exact length. One is a double the other is a Tripple. Yeah I know a 6-pack would do fine to replace these 2 but hey plan for expansion, eh? Make it an 8 pack and there ya go! I know, silly thinking on my part. Just having fun. They replaced Challenge and Cannonball with this. Peter, you prove prophetic once again. Well done. The prophecy came true. Well done Peter. Look for Powdr to go bubble-8 after getting their Copper and Killington projects one-upped by Big Sky. 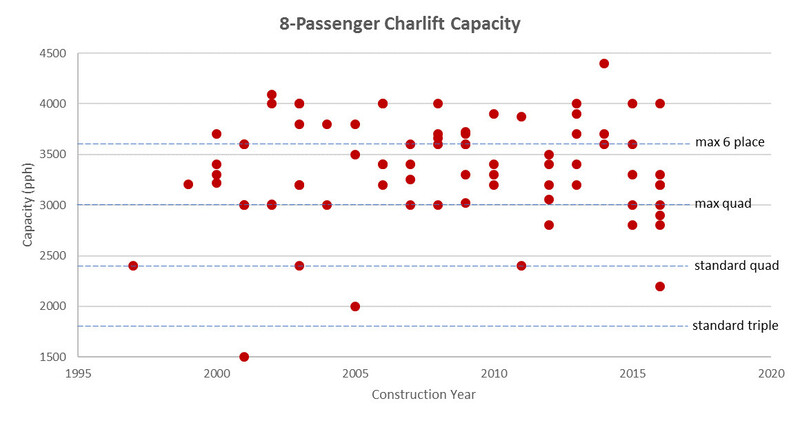 I expect the lift arms race that started in 2010 to continue. The Canyons was first with the Orange Bubble Express, and Mount Snow one-upped them by getting the first bubble-6 in North America the following year. 3 years later, Okemo struck back by building the first bubble-6 with heated seats. The following year, they bubblized the Jackson Gore Express, becoming the first and only public ski area with two bubble lifts, which they for one year until Big Sky opened Powder Seeker which was their second bubble lift in addition to the Lewis and Clark lift they inherited from Spanish Peaks. This year, Killington is joining in on the action by adding the Snowdon Six Express at Killington and American Flyer at Copper. Just one week after their announcements, Big Sky one-upped them by announcing Ramcharger 8. As Copper is pretty much built out that leaves their two other large resorts Mount Bachelor and Killington. I’ve never been to Mount Bachelor, but Killington has two high speed quads that need replacements which are Superstar (due to age), and Ramshead (due to capacity). I believe the long term plan was to replace key lifts with bubble-6’s, but if they want to get back at Big Sky, they can change one or both to bubble-8’s. why can’t 8packs go 4800pph? Doppelmayr doesn’t like going that high because it becomes extremely difficult to load. same reason a six pack can do 3600 and a quad can do 3000 but they are discouraged. I refer you to Vail and their new 3600 per hour six packs having loading problems.